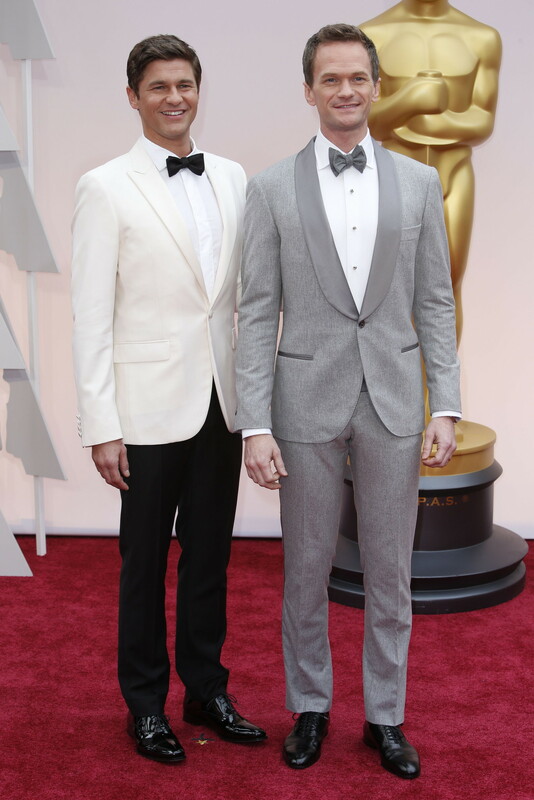 Today is February 22, 2015 aka THE OSCARS, which means it’s time for my red carpet fashion breakdown! Here we go! First things first, at 5:40 p.m., Patricia Arquette (Supporting Actress nom for “Boyhood”) announced that she skipped her manicure to focus on launching her new philanthropic site, givelove.org. What a neat way to bringing the trend of #AskHerMore to a focus. Next up we have Josh Hutcherson (or Peeta) looking oh-so-dapper in his suit with slicked-back hair. “Jane the Virgin” star Gina Rodriguez looks ahmazing, however, this picture doesn’t do her justice. The best shot: when the E! cameras caught her getting out of her car, a much better angle of the dress. E! anchor Guiliana Rancic looks as gorge as always, with the lace and the bright red color. Jamie Chung looks gorge. I love this dress. It just screams Oscars! LOVE LOVE LOVE. And of course, here’s our host, Neil Patrick Harris himself. One, NPH is so hilarious, he just needs to host everything. If you haven’t seen him hosting the TONYs, watch it here before the Oscars begin/ during a commercial break. He’s hilarious and I can’t wait to see what he does at the show. Ellen did a great job last year, so it’ll be interesting to see if he can top her pizza order and Twitter-breaking selfie. Faith Hill in J. Mendel. Love the dress. Very well-tailored. Margot Robbie looks head-to-toe gorgeous in her Saint Laurent gown and vintage necklace that was made for the Duchess of Windsor in the 30s (wow!). Everything is perfection: from her dress, jewelry, red lip and her HAIR. AH-MAZING, PERFECT. Best dressed, for sure. Laura Dern: love her dress by Alberta Ferrati. And she did a great job in “Wild.” Love how she told Ryan Seacrest about her Bulgari ring, made in honor of Cheryl Strayed’s mother Bobbi who she played in the film. How inspiring. “50 Shades” star Dakota Johnson in Saint Laurent posing alongside her mother looks pretty. Not sure how I feel about her dress, other than the color, but I love her simple ponytail! It’s perfect. BEST DRESSED COUPLE ALERT. Adam Levin and wife Behati Prinsloo (both in Armani) look incredible. No words to describe this picture other than PERFECTION. And Eddie’s costar in “The Theory of Everything” Felicity Jones looks STUNNING in Sarah Burton for Alexander McQueen. LOVE. AHMAZING. Another great celebrity couple. Chrissy Teigen looks gorgeous in Zuhair Muriad and her hubby John Legend looks dapper in Gucci. Rosamund Pike. Gorgeous. And she looks like this pretty much after just giving birth? Woah. Zoe Saldana looks like this after just giving birth to twins? Double woah. But, gorgeous dress, jewels and hair. Marion Cotillard looks gorgeous in Dior Couture. However, this picture doesn’t do the front of her dress justice! Miles Teller! 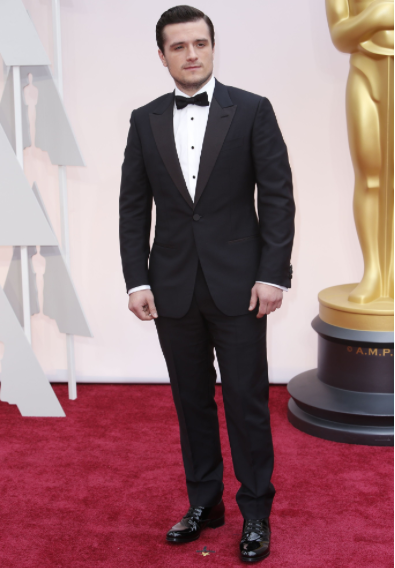 The “Whiplash” star looks suave and dapper here in his Prada tux. Lupita Nyong’o looks incredible in custom Calvin Klein by Francisco Costa. Gorgeous. And all the little pearl details! It’s made of 6,000 pearls! Oscar favorite Julianne Moore looks gorgeous in her CUSTOM Chanel gown, but she always looks gorgeous. It’s Kerry Washington in a gorgeous white Miu Miu peplum dress. LOVE IT. Rita Ora: gorgeous. End of story. Breathtaking. Reese Witherspoon: Gorgeous. Her hair and that dress: so sleek, so elegant, so classic. Love it. Always on the best dressed list: Reese. Gwyneth Paltrow’s dress is perfectly tailored and a good color. However, I’m not sure how I feel about her shoulder-ruffle thing. Chris Pratt and Anna Faris. LOVE HER DRESS. And he helped carry her train so it wouldn’t get wet… Awww too presh. But, love this celeb couple and her dress is so Oscar-worthy. LOVE. J. Lo’s princess moment dress, but not her party dress, and she looks absolutely STUNNING. GORGE. One of the best dressed, for sure. Jennifer Aniston looks stunning. Gorge. But, she always looks amazing. Emma Stone looks incredible. Truly breathtaking. Ah-mazing. LOVE LOVE LOVE. Perfection. Keira Knightly looks gorgeous here in Valentino. Love the tulle, the flowers, the appliqués. Love it. And… one of my favorite celeb couples: Channing Tatum and Jenna Dewan-Tatum. Both look great, as their outfits are very well-tailored and look impeccable, classic.